It's that time of year again where Apple is feeling generous and will be giving away free stuff like music, games, apps, and books for 12 days. 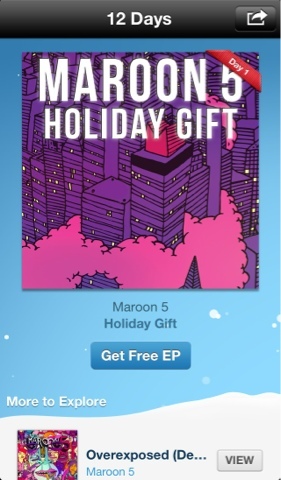 And to kick things off, Day 1 is Holiday Gift Single by Maroon 5 which includes 2 songs: 1) Moves like Jagger, 2) One more Night (Cutmore Club remix); and the Moves like Jagger music video. Not bad for a first day haul. Just download the 12 days of Christmas App to get access to all the freebies.